I just finished a really great read. 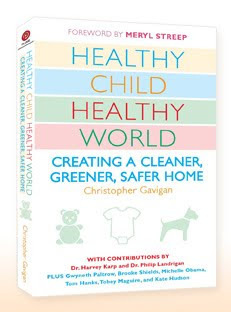 It's a book called Healthy Child Healthy World: Creating a Cleaner, Greener, Safer Home by Christopher Gavigan. I loved this book. It's the kind of book that no matter where you are on the organic, green learning curve, you will learn something invaluable. Every chapter has great information and quick tips to get you started. I couldn't begin to tell you everything this book has to offer, but let me highlight a few of the chapters to whet your appetite. Then you will just have to get your own copy! Chapter 1 is cutely named "Doing the Bump" and is all about preparing for the birth of a child. It gives great tips on eating, products to avoid, a great natural body butter recipe, and finding safe nursery and baby stuff. Chapter 2 is all about cleaning supplies including what to avoid and great natural replacements for the dangerous stuff. That is one thing I really appreciated about this book. All through the book Mr. Gavigan informed you about the danger of a product and then recommended a safe, inexpensive, natural alternative. Chapter 6 talks about safe gardening and lawn care. There are so many great tips here. He talks about simple ways to improve the health of your lawn without pesticides and fertilizer; how to fertilize naturally; and some helpful tips on bug and mosquito control. Chapter 8 gives great tips on raising a "green pet". Our only pets are two adorable guinea pigs, but I appreciated the great info on natural flea control; recipes for good dog food; and a nontoxic pet cleanser. I could seriously go on and on, but really, you should just get this book and take a read. If you are a star-watcher, there are also great tips from celebrity supporters as well as leading medical and public-health experts. A few of these included Jenna Elfman, Laura Dern, Noah Wylie, Tom Hanks and Rita Wilson to name a few. At the end of the book is a GREAT chapter of resources giving you contacts for things like diapers, bedding, bottles, clothing, cleaning products, snacks, garden and lawn products, and etc. I plan to work my way through this list in the coming months and educate myself more on what is out there. I will defininitely pass along great finds to all of you! The organization Healthy Child Healthy World was started by James and Nancy Chuda in 1991 after their beloved daughter Colette died from Wilms' tumor a rare form of nonhereditary cancer. They are a 501(c)(3) organization whose mission is to "educates parents, support protective policies, and engage communities to make responsible decisions, simple everyday choices, and well-informed lifestyle improvements to create healthy environments where children and families can flourish." Their site offers more great tips and resources for anyone trying to make their home and life a safer, greener environment. Thanks Janelle Sorenson from Healthy Child Healthy World for the great opportunity to review this fantastic book! I definitely recommend adding this one to your must read list. That does sound like a great read! Thanks, I've bookmarked it! Thank you for helping to spread the word about natural living ! Are you on twitter too ? Hi Hanlie! You would probably love this one! Welcome Diana and thanks for joining us her as a follower! I'm looking forward to checking out some of your links! We love natural skin care products here on LAWL so let us know if you need any guinea pigs! :) Shannan and I both are on twitter - you can find our links directly on the blog if you scroll to the bottom. This book sounds like one I'd love to have. I starred this post. Hello Evelyn! I just checked out your blog yesterday and love it. I'm looking forward to reading more!